As its name indicates it, “Different Stages” is a collection of live tracks that Bjorn Jeppesen has performed in various locations and through many EM festivals. From Sweden's Nordberg Festival to the Awakenings Festival of England while passing by the very famous E-Live in Holland, without forgetting his performance at the Germany's Raumzeit Festival, this 2nd live album from Nattefrost follows a chronological order of these performances which took place from July 2010 until September 2012. The album is offered as download and also in a physical CD which contains a track in bonus played in Copenhagen in October 1999. And what it is to say about “Different Stages”? Well, not a lot of things, except that it's very good but also very short. With its nervous and curt rhythm which shakes an electronic melody and its tremulous tremors, "In Natura" sets the tone to an album where the rhythm; hard, pure and lively, prevails throughout the 45 minutes of “Different Stages”. 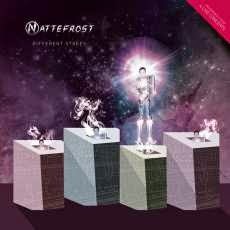 Nattefrost presents here a solid set list with 9 tracks where the electronic rhythms send to us some pleasant earworms which are very good to hear again. We stamp and we whistle for those melodies in a universe of cosmic techno which is similar to Jean Michel Jarre's sonic frescoes. Only the financial means are lacking to support this interesting Scandinavian artist as far as the gargantuan madnesses of the French synthesist are. Well, this is another debate. The performances turn around the presentation of the Dying Sun/Scarlet Moon album, which is rather well represented with 3 lively tracks; "In Natura", "Draconian" and "The Dark Spell". And we have also entitled to 2 great classics pulled out from the Absorbed in Dreams and Yearning album with the title-track and the superb "Valhal" and its soft contemporary touch. Bjorn Jeppesen goes as far as on 1997 with the dreamy and lively soft cosmic techno "Intergalactic Journey" and 1998 with the boiling "Transformation". And then we have another classic to be with "Ghost Mind" from the Futurized album. And in spite of the years which separate "Intergalactic Journey" and "Ghost Mind", Bjorn Jeppesen manages to cement the whole thing in order to give the illusion of a very beautiful album of cosmic techno with very current flavors, even with sound a bit aged and very automated of "Nightfall". Without surpassing the very strong 2010's Live in Germany “Different Stages” is an interesting compilation of tracks which have everything to charm all the fans of soft cosmic techno and ambient dance music. It's 45 minutes well packed with a good update of old tracks which doesn't distort them and which gives them a bit of youth therapy. And we cannot ignore any link between the music and the artistic approach which exists between Nattefrost and Jean Michel Jarre. So that I dream of a day when both will occur together, mixing an EM which has so much in common. It's of a frenzied and hyper ventilated way that opens this fascinating musical story based on a manuscript found in a military camp of Greenland, near Thule. A fictitious story where the Carlos character meets a strange entity which seems to know more on him than himself. This is a beautiful basic idea which is spread out over 9 very distinct pieces of music, from where the feeling of unlikelihood in order to create a musical story which wants to be at the height of its so surprising outcomes. Alone, Edgar Froese seems to be afraid of creating. He is lacking of inspiration, boldness and originality. Becoming then predictable, even boring by moments. Nevertheless the story of “Chandra: Phantom Ferry-Part I” seems to have an interesting musical reach for EM; a musical art which has the advantage of becoming theatrical, filmic with a pleiad of instruments able concoct a whole range of possibilities. But Edgar never touches upon this interesting possibility. Our silver fox is very drab, colourless. Not that “Chandra: Phantom Ferry-Part I” is that boring, far from it. It's a beautiful opus, but the boldness of its story is missing. With "Approaching Greenland at 7 PM", it's clear that it sounds like a wild race. The rhythm is nervous, jerky and runs on a bass line which espouses the shade of sequences spread like keen knocks of percussions. This is a good track. A good enter with moves of funk and with sequential variances coated by fine Tangetized layers. Imho, it's too short and a real kicker. "The Moondog Connection" spits a somber sensibility with a smooth play of synth from which the lines waves in loops and a discreet mellotron are filtering harmonies through some reverberating mist. Edgar spices the whole thing of tuneful scattered chords which decorate this soft melody of a dark greyness that continues up until "Screaming of the Dreamless Sleeper"; a black title, but without souls with these vocalizes tinted of false feelings which glean here and there on a rhythmic progress which is lacking creativity. This track is so much sounding like the repertoire of the Melrose years and seems to be way out of this work of fiction, just like "Child Lost in Wilderness" and its choirs obscured by a so fade poetic approach. Not bad, but we speak about Froese and TD here. "The Unknown is the Truth" starts with a black linear wave blown by sonic arches tinted of blowpipes. This is an intro vaporously original which switches mood for a more nervous pace, seasoned of delicious crystal clear arpeggios which float in this universe closer of chaos than of harmony. The rhythm there is sluggish and stumbles into hallucinogenic psychotronic limbos which recall the first artistic gaps of the Dream. I liked it. It's a very good track which releases an abyssal mood where the remorse shows up in all the hidden recesses. Synth with intriguing laments, fluty and discreet mellotron with arrangements of a sadness to graze the soul; "The Dance without Dancers" is a baroque black ballet which spins in a bitterness subdued of a fragile hope. I think it's a very nice track which calls back the period of Legend. "Sailor of the Lost Arch" is a beautiful ballad taken from a New Age soil. It flows well, but we are far from a well structured EM, even if Edgar adds his heterogeneous tones. And the more we progress and the more we fall in a kind of musical easiness. Melancholic themes which repeat and which only have by tasteless synth lines which glean here and there, making believe in any emotional evolution while that everything sounds so much like old rehashed. 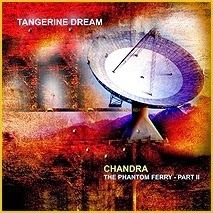 All and all, “Chandra: Phantom Ferry-Part I” is a nice album but I was expecting much more. But isn't what we all hoped from years? An unequal album where some pretty good music parts are getting lost in pretty poor and weak moments. Moments and tracks which show all the difficulty of Edgar to surpass himself. Edgar is getting old and becomes very gloomy. And this gloom perspires on this album where the rhythms and ambiences have difficulty to find original forms. It's good and it listens pretty well, but something is missing there. How we can jump from almost being excellent with the Sonic Poem Series and switch to something very average with a studio album such as “Chandra: Phantom Ferry-Part II”. Or should I begin this by asking if a suite to the Chandra: Phantom Part I was really needed? Already that the basic idea was good and that the musical outcome seemed totally disconnected, so why going there around 5 years later. But let's say it from the start; I quite enjoyed the musical ride of “Chandra: Phantom Ferry-Part II”. And this even if I always had the feeling of déjà-heard which floats here and there. Déjà-heard which flirts with the Eastgate years of the Dream but also with the beautiful years of Froese, Franke and Baumann, from where my interest in it. I even hear, yes yes, synths with Mephistophelian fragrances of the Ricochet times here and there. "3 Rotcaf Neila" presents a beautiful ballad whose soft airs are disconnected from the feverish bed of sequences which makes feel it keys so nervous. The style is very Eastgate with melodious and sober synth lines and discreet idle singings. "Aldebaran" is another track like we are used to hear quite often over the last years of TD's repertoire. The rhythm is ambient, quite as a helicopter which floats with a lot of effort against the multiple synth layers a bit swampy. In the end it's just as good as easy to listen to, just like "Cygnus" which is very lively on the other hand. But we have already heard these musical structures so often. "Dnammoc Su" is a track which hooks immediately the ear with a rhythm as effective as attractive and good guitar solos. Good e-rock there! And the more we move forward in “Chandra: Phantom Ferry-Part II” and the more we let ourselves be seduce by moods which at the end seem to fit with Edgar's tale. "Capricornus" is a somber ambient melody where we have difficulty in distinguishing the chords of a melancholic guitar from chords of a keyboard/synth just as much gloomy. Synths draw shoal of nostalgia with a black elegance which suits very well to the very dark approach of the track. In the same style there is "Centaurus" which drags its shagreen on an a little more stormy structure of rhythm. "Apus" presents a nervous, a lively rhythm with percussions of felt-tips which lets its beat to be nibble by sober keyboard riffs. The ambiences are tetanized by numerous pads of a synth and of their lugubrious aromas which float on a rhythm of which the fine modifications live within knocks of percussions. Good but without surprises, this is TD as we are used to hear whereas that "Auriga" and "Columba" exploit the same structures but with ambiences and sequences which bring us very near to the Flashpoint era. I really liked those 2 tracks. "Monocerus" ends with an approach as much sad as sinister where Edgar vaporizes his very Tangetized synth pads on a slow rhythm. One would say a march of a solitary cowboy who leaves a city that he cleaned of its bandits. 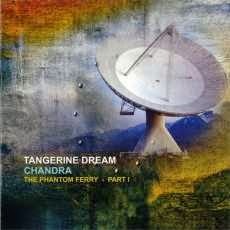 One cannot say that “Chandra: Phantom Ferry-Part II” is a bad album as well as we can't say that it's a genius one. Alone...Edgar feels very lonely. It's an honest album which can turn out to be disappointing if we fixed our expectations very high about Edgar Froese's creativity. Me? It has been a long time since I fixed my bar of hopes at a fair height. This is probably why I like this new chapter in Edgar's fantasies. Dusty winds make sing their prismic particles which mutate into long guttural drones. On a carpet of finely drummed percussions and scattered noises of ballasts, "Beacon I" shakes its frail ambient rhythm which skips in sinuous hoarse voices and synth pads to the soft airy caresses. 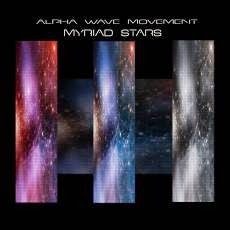 It's with pleasure that my ears get stuffed again of the very cosmic universe of Alpha Wave Movement. Composed between 2006 and 2011, “Myriad Stars” is a fascinating fusion between the very cosmic sequenced style of Thought Guild, another Gregory Kyryluk's project, and the ambient music a little more down-to-earth of Alpha Alpha Wave Movement whose cosmic fragrances are filled of influences by Vangelis and Steve Roach. "The Dark Lure" follows with astral synth waves which float as angels' sighs. The onset is profoundly ambient with lines of synths which interlace into soft crystalline chirpings. A line of bass frees furtive chords, shaping so a cosmic rhythm which moves stealthily in order to finally adopt a tangent a little more livened up with metallic jingles and soft absent percussions which put the table to a beautiful line of sequences to the nervous jolts. Swirling and zigzagging under the caresses of a synth which prefers the cosmic moods to some brief ethereal solos, the rhythm of "The Dark Lure" becomes spheroidal and also becomes a prelude to the very beautiful "Anatomical Universe" and its cosmic fury à la Jarre. After the very cosmic, extraterrestrial and ambient rhythm à la Roach (all this there in hardly 3 minutes) of "Beacon II", the saga Gravity Well Flux brings us in the most enveloping borders of the cosmos such as seen by Gregory Kyryluk. We would believe to be in a space shuttle, immersing from a long cryogenic sleep, with slow morphic moods of "Gravity Well Flux Part I" and its waltzing and philharmonic synth waves à la Vangelis. "Gravity Well Flux Part II" falls in our ears with a resounding intro, kind of THX, before evaporating its astral waves with the coming of a strange rhythm which is panting on a fascinating meshing of sequences from which the hatched jumps are structuring a cosmic Roach dance beneath slow and morphic synth pads. Nervous and very lively, with good synth solos filled by the Berlin School perfumes. We dive back into the industrial cosmic darkness à la Blade Runner with "Beacon III" which aims to be a beautiful and adequate intro to the very good and entailing "Anatomical Universe" where Gregory Kyryluk mixes skilfully his Jarre and Roach influences in 7 too short minutes. Brilliant! The introduction of "Singularities" shows at which point how Alpha Wave Movement handles to perfection the cosmic structures rich in sound depths. We would guess to be in a lunar base observing a dance of stars which sparkle around celestial bodies and cosmic auroras borealis. A line of bass sequence spreads chords as slow as heavy whose resonance draws a furtive ambient rhythm which swirls delicately, like a rangy stroboscopic filet, under the more and more present singings of interstellar oracles. "Star Birth" adopts the same precepts but in a longer frame and with a beautiful ambient rhythm finely drummed in tandem with more crystalline sequences. "73 74 61 72" presents a structure clearly more exploratory with a thick cloud of cosmic tones which slide over radio transmissions and the hootings of strange extraterrestrial bugs. It's an audacious track to conclude an album which mixes marvellously the ambiosonic boldnesses, the always serene exploratory moods as well as the cosmic rhythms as much lively as restful. In brief an album just as the image of Alpha Wave Movement; an artist who never stops amazed and whose discovery I strongly recommend. Dark riffs of keyboard dances on heavy percussions. Lighter chords float at the same time as some very ethereal choirs. We frown and we wonder if we are not listen to a piece of music forgotten in the vaults of Tangerine Dream, periods Thief or still Flashpoint. With its rhythm hammered in a relative nightmarish sweetness "Labyrinth" spreads all the weight of its paradox between the naming of its album and the sudden way of finding the heavy electronic rock of Tangerine Dream very inviting. Playing on the various creative stages of the famous Berlin trio, “Soundtrack for Dreams” has nothing of a soft invitation to reverie. It's an album of pure and hard electronic rock which drinks of the influences of Tangerine Dream and of its more cinematographic approach with short tracks, filled of beautiful moments of ambiences, where one hears with pleasure reminiscences of the Thief to Poland while passing by Le Parc. 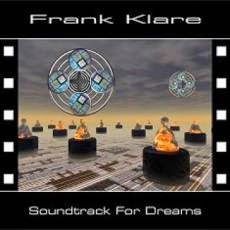 But let's start of its genesis …“Soundtrack for Dreams” was initially realized in 1999 on Frank Klare's personal label (Traumklang Self-Released TK-CDR-9). This first version offered 11 tracks named Dream 1 to Dream 11. A first remixed and remastered version saw the light of day in 2006 on the German label SynGate with 6 new pieces of music. Rapidly sold out, “Soundtrack for Dreams” saw a 3rd edition, always on the SynGate label and on the same format as in 2006, on October 2010. Although written between 1998 and 2006, the music of “Soundtrack for Dreams” is a mosaic of heavy and lively e-rock which doesn't suffer at all from the artistic gap between its 8 years of writing, thanks to a very good mixing of sequences (made by Valleyforge's Thomas Bechholds) and a very beautiful remasterisation made by Bernd Moonbooter Scholl, such as we can discover when listening to "Labyrinth" and "Unknown Excursion". The first sequence of rhythm of "Unknown Excursion" is directly attached to the last beating of "Labyrinth" and the track offers a strong electronic rock à la Bondy Parade or still Dr Destructo. "Orientalic Excursion" presents a superb melody imprinted by perfumes of East on a bed of twinkling sequences. The rhythm takes time to take shape. Floating between harmonies and ambiences, he flogs the time with powerful electronic percussions which pave the way to a great silky melody and therefore a catchy musical itch. Lively and harmonious, we shake of the head and we stamp of the feet such as in the summer of my 14 years with a soft perfume of Patchouly. The symphonic synths of "Through the Spheric Timegate" caress a structure of circular rhythm where spheroidal sequences are harpooned by percussions of which the hammered knocks melt down again the rhythm in a more linear approach. Still there; Bondy Parade or Dr Destructo, but in more ethereal mood. "Stratospheric Impression" offers a more evasive structure where the rhythm is slow and pounds with a certain heaviness, a little as in "Twilight Situation" and its filmic approach which reminds me of Near Dark. Jingles and percussions hit a hypnotic rhythm that the voice of Sabine Klare overhangs of esoteric singings. "Living Illusion" falls in our ears with a wave of sequences of which the undulations flutter nervously before tumbling in the filets of percussions and their electronic military rollings. Simple but efficiently catchy! And as we go on into our discovery of “Soundtrack for Dreams” we find that the rhythms and the moods which are hiding there are all of known territories. And the music is heavy. If we hear with obvious fact the influences of Tangerine Dream, we also hear the very personal approach of Frank Klare whose creativity has nothing to envy to the multiple faces of Edgar's bands. When our ears uncork "Timegate through Underwater Worlds", we perceive a subtle different between the eight new tracks which separate both releases. Here, the recollections of the Dream are closer to the Le Parc years with a movement of sequences of which the vaporous tones remind me of Poland. The rhythm is more clear, less heavy, and remains very lively with this structure which flutters like the wings of a butterfly prisoner of his vertical tube. After a quite cute and lively "Cosmic Lovescene", "Confrontation" dips us back into the moods of a Thief perfumed of the powerful blackness of Near Dark. It's a great track with a brilliant game of electronic percussions which ends in the bouncy Teutonic sequences of "Dream-Surrender" which leads us towards something like ambiences of The Keep with "Running Away". And if we miss the moods of Optical Race, we listen to the very melodious hypnotic tick-tock of "Vision of a Timebridge" which, at times, adopts a little the harmonies of Underwater Sunlight, especially with a very dreamy guitar. The harmonies are melting in the very ambient "Garden of Wonders" which brings us up to the heavy and powerful "Awakening out of Dreams" and the very incisive guitar solos, as well as mordant riffs, of Max Schiefele which float and gallop such as of melodious threats. Very good. "Rising Back to the Dreamlands" and "Dreamgirl on the Broadway - Dream or Reality?" end a surprising album among which the essences and the spirit embrace the cradle of the influences of an artist who got himself literally the sound of TD from the 80's, as much by means of the equipments as by an obvious passion for the film music from Franke, Froese and Schmoelling. And I, I hear souvenirs of Le Parc floating in my ears after that the last notes of "Dreamgirl on the Broadway - Dream or Reality?" have fallen. 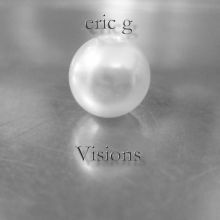 It's always a pleasure to have news of Eric G, even if they are old news. Like in Illusions, “Visions” comprise some old musical pieces written in the 80's. Musical structures improvised and immortalized on cassettes that the Swedish synthman has reworked and remixed in 2011 in the respect of his inspirations. Inspirations pulled of the vintages years of an EM sculptured by the analog equipments of key names such as Klaus Schulze, Tangerine Dream and Jean Michel Jarre. These three names decorate the firmament of "Visions" which is a wonderful temporal footbridge between two universes separated by a digital vision. Breezes of Orion blowing of a vertiginous swiftness open "Moonmusic II". Lines of synth are floating around like ectoplasmic spectres roaming in search of a rhythm, of a melody. We are floating in a full weightlessness state à la Jean Michel Jarre before that this morphic movement embraces a furious dance of oscillatory lines. A dance where the lines crisscross with increasing and decreasing cosmic movements that superb plaintive solos surround of a stunning perfume of the beautiful years of analog EM. With its muffled pulsations which shape a linear hypnotic movement, "Moonmusic II" embraces the reminiscences of Oxygene and Equinoxe with a clinch for the lost rhythms, as these trains which come to tickle the hearing towards 5:20, of Magnetic Fields. The title evolves by interphases which follow a tangent going to more ambient-cosmic moods with soloing breaths glancing through pulsations and drummed sequences of which the irregular beatings end a rhythmic structure fill of an intergalactic evolution convoluted. "Mind Windings" attacks straight away our ears with a bass line which forge fat quivering chords bouncing on the backs of percussions with heavy symmetric drums. The movement is of a hypnotic heaviness with these heavy pulsations which resound in our eardrums while that fine solos chiselled by some kind of theremin aromas surround the minimalist hypnotic knocks. This fusion of bass/percussion transports synth solos and isolated pads in a cosmic broth which insufflates to “Visions” its very beautiful electronic ambience with mixed fragrances of Jarre, Schulze and Tangerine Dream (and even Michael Garrison), in particular with this combination of solos, cosmic effects and mellotron fog which coat a 2nd quieter portion of "Mind Windings". After these two very livened up cosmic incursions, “Visions” undertakes an ambient-spherical change of direction with "Hallucinogenic" and its heavy psychedelicosmic sound mass which widens a profound ectoplasmic ambience. Floating waves of a black organ are shaping a parapsychological intro where other waves more elusive are amplifying this dark approach which flirts with the fragrances of Schulze on Blackdance. And from everywhere are fleeing these astral serpentines which float on a structure in perdition and filled of melancholy. A somber nostalgia fed by floating and wandering synth pads and all of those analog cosmic effects that cemented our perception of a parallel universe when listening classical EM such as Blackdance, Body Love, Encore and Green Desert (or was it Atem?). The intro of "Discovery and Loss of Crystal Vision" breathes of these musical fragrances with long spectral veils which free slow vampiric waves. Segmented in several parts that eventually establish a coherent collage, this Eric G's epic track spreads out its mesmerizing musicality from a bass line which weaves its oblong rhythmic pulsating structure in the den of an organic cosmos where jingle of rattlers, rains of sound stars and foggy choruses are caressed by tortuous synth lines and dark organ layers. Quietly we pass in a more livened up stage with colorful pulsations which pound in the shade of more philharmonic synth layers. Always soaked in a strong cosmic broth, "Discovery and Loss of Crystal Vision" elaborates the main lines of a pulsatory rhythm which resounds beneath wonderful twisted solos which are spinning in mists of ether. Synths and a guitar are exchanging great solos with this musical scent of Ricochet and Encore under a brook of sequenced ions pounding in all directions. Indomitable, the rhythm feeds of lost sequences and steady percussions which sparkle and strike beneath a superb duel synth/guitar of which the solos accompany a cosmic ride decorated by rains of sound stars. It's very good, as the entire whole of “Visions”. John Lyell is an American musician who began his career by playing guitar, at the dawn of the 80's, within diverse rock and hard rock bands. His career took a tangent closer to the electronic art at the beginning of the 90's when he discovered the ambient and cosmic music by listening to the famous radio show Hearts of Space. Since then this musician native of Minneapolis built quietly his own studio. He became with the years a very active personality in the up universe of the cosmic digital art, we can view his numerous paintings on his web site, and the ambiospherical American music by becoming a composer, a producer and a sound engineer for various projects which were inspired by the horizons of this American cult radio show. “Reflection of Time” is his 5th album and presents a very beautiful collection electronic music pieces where the mysticism and the esotericism mix up on structures of ambient, as dark as romantic in the soft fragrances of Vangelis, where the stars and celestial bodies sing the divinities of a cosmos to the unsuspected horizons such as put in music by a passionate of astronomy. 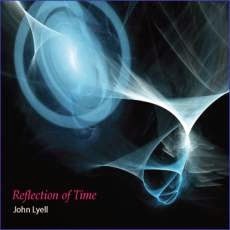 And we enter the universe of John Lyell's intergalactic atmospheres by the main entrance with steps of a sequencer to staggering organic chords which open the fragile ambient pace of "The Deep Unknown". Our ears discover, or imagine, a fascinating intergalactic dialect with tones which adopt a delicate structure of rhythms of which the little deformed echoes resound under morphic synth pads. "Above the Stratos" roots the perception that we are almost in the psybient world by spreading its translucent seraphic pads, where fine voice filets from the oracles of snows are escaping, which cover some electronic chirpings frozen between two ambiospherical layers. This is soft and floating, just like the title-track which takes the air of an ambient funeral walking and the next 40 minutes of “Reflection of Time”. Closer to the melancholic spaces of Vangelis, "Dreaming in Sine Waves" spreads some delicate arpeggios which sing their fragilities in breezes of Orion. It's a very beautiful piece of music soaked of an attractive ethereal approach, just like the very beautiful "Space Ethereal"; the most beautiful track, imho, of “Reflection of Time” with this superb voice of cosmic Efle which hums with a symphony of stars. "A Far Away Place" is not outdone with its heavy and slow cosmic waves which roll over the singings of forgotten celestial bodies. Soft, dark and very melancholic. "Dreaming in Sine Waves II" presents the little darker side of its first part. But if the arpeggios are ringing with so much brightness here, the ambient structure is clearly gloomier. And we cannot be immersed farther in the cosmos than with the very black "Crossing the Barrier". This long ambient track sounds like a slow journey inside a space shuttle, needs to listen to it with headphones, where, fascinated, we watch the blackness becoming blacker. Even the seraphic voices, very discreet y the way, cannot manage to uproot this perception to sink into even more dark. We see the quartet which fades out behind a valence of ice which drops its gouts as it melts. A room in a somber building. Garbage scattered everywhere. Waste, excesses of the humanity. And behind these images floats the idle introduction of "Welcome to the Asylum". “The MELTdown Concert” is a very audacious project which rests essentially on the quality of the visual effects and graphics, which are interlace and melt themselves on a big screen behind Code Indigo, when the famous English progressive EM group has played the unique performance of MELTdown at the E-Day Festival in Oirschot, Netherlands, on April 6th 2013. The music is essentially the same. Intros and outros vary. Shortening or lengthening some tracks without modifying really the spirit of the album. 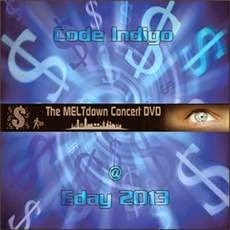 Except that “The MELTdown Concert” is not essentially a video of Code Indigo in concert, although we rather see quite often the group in action. It's a DVD which groups all the stories, imagined and set in graphics by Nigel Turner-Heffer, which hide behind every piece of music of the MELTdown album. And these graphics are amazingly beautiful. The space, the real world, the money, stock exchange, big computers and health business. Everything is magnificently well designed and inter-connected with sharpness in the main lines of this concept album from Code Indigo which denounced mainly the financial greediness of a society which eats itself from the inside. And these images, these Nigel Turner-Heffer's visions melt themselves, coming from the ice or from the fire, marvellously with the shots of the quartet, dressed very soberly, which reconstituted splendidly this very beautiful album which is MELTdown. I really enjoyed watching “The MELTdown Concert” and I really think that it should serve as reference in what concerns the future productions of this kind. It's a very beautiful DVD where the music serves the cause of Nigel Turner-Heffer's intuitivity. And the fusion between graphics, visual effects, short films and the images of the group in concert is just in time. There are no lengths. We see just enough of Code Indigo and the music is the real star and not the contrary. And above everything, we can now see this very beautiful album with a dimension that we did not even dare to image in our head. Very well made and it goes great on my big HD TV screen... a little as if I was there. The first notes of piano which fall remain congealed in the time. One would say tears of cosmos which sparkle in the curvatures of intergalactic breezes. This wonderful, and much romanced, introduction of “Ignacio” has rocked my dreams since years. So beautiful, so moving that I would have liked that its small duet so innocent with a synth and its sonic pearls and sad violin lasts beyond its graceful 4 minutes. But nothing is lost because in the world of Vangelis the melodies or reveries like hare are often recurring. Here is an album which is really past under the radar of time, but which has all the same aroused many controversies. “Ignacio” or Entends-tu les Chiens Aboyer (Can You Hear the Dogs Barking? ), is a soundtrack which went out in the stride of Heaven and Hell in 1975. A mythical album because he exists under several naming, of which a Mexican version, and on which an error (volunteer?) during the mixing, while being digitalized into the CD format, made of it an album which engendered so many passions as dissatisfactions among the fans of the Greek musician and this imbroglio have many a time mixed fans, columnists and historians of Vangelis. If at Barclay we find the original work, at CAM Record the Face A of La Fête Sauvage found its place on Face B. 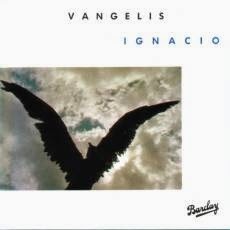 A choice which has pleased to the fans of a more musical Vangelis, because we have to admit that the face B of “Ignacio” is rather difficult to tame. While the dusts of the first melody are fading away, a sharply more monasterial approach floods our loudspeakers with these soft pastoral voices so unique to Vangelis who hum through bells, carillons and synth chirpings. This is more than beautiful and the very melodious wind of violins transport us literally in the core of Heaven and Hell with this rather dramatic symphonic and cinematic structure which quietly will go lulling in the soft and romantic artificial violins of which the harmonies are as much lunar than seraphic. And this melody, so haunting, comes back disturbing our emotions with a big organ which spits its fury. But still, this remains very musical. A fury which melt and scatters its ashes in this too beautiful introductory melody of the Face A. This piece of music is a pure beauty underestimated in the career of Vangelis. But as much Vangelis can be melodious, he can also offer some very stormy dishevelled structures. This is straight what is happening with the opening of the Face B and its first 7 minutes which offer a kind of free-jazz and improvised rock with superb solos from a synth which draw braids on a devilish rhythm of which the introduction sounds strangely like what's going to become the frame of Pulsar. Afterward we fall in a more peaceful structure with electronic effects, which we also will recognize on Pulsar, which perturb the temporary quietude of this atypical structure. Follows then a stream of electronic noises and percussions of any kinds which model an always invisible rhythm (Invisible Connections?). And quietly this ambient and noisy sonic skeleton gets lost to go towards a very cosmic passage before being charmed by a delicate tribal melody à la sauce Greek. A very beautiful melody lost in the tumult. It's the kind of finale that seems to have inspired the electronic rumbas of Jean Michel Jarre. A flock of sequences and undecided chords stomp on the winds and the knocks of cymbals of "Open the Gate". From these first seconds, we re-know this ambient rhythm so characteristic of the Repelen project. The chords raise themselves like riffs while the percussions, which flicker of fragility, supplant the sequences. Ringings, floating tsitt-tsitt and electronic chirpings decorate the ambiences, while that quite slowly a tribal structure of rhythm takes control of "Open the Gate" which skips in the curvatures of a bass line and of its throbbing notes. The rhythm is soft, between cosmic tribal and ambient groove. Well sat on percussions which sound like acoustic clanic ones, it pounds beneath the colors of synth solos rather dreamy which get melt in a sonic decoration flooded with mist bluish. Composed, interpreted and registered between 2011 and 2013, during a series of concerts and rehearsals performed at the Repelen church, “Repelen - The Last Tango” is an album which inhales literally the rhythms and the moods of the Repelen series. There are no surprises. 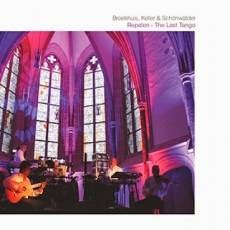 Only some very nice music, among which 2 superb tracks, where the Broekhuis, Keller & Schönwälder trio accepts the tribal and ethereal caresses of Raughi Ebert and Thomas Kagermann. A little as in "Open the Gate", the introduction of "Philadelphia - The Repelen Mix" offers a structure which looks for itself and which quietly sets its shape with a series of floating sequences which get lost in the muffled pulsations of a bass line. Clouds of synth float in the horizon while trumpets try to wake up the ambiences. Ambiences which will stay of silk throughout the 12 minutes of "Philadelphia - The Repelen Mix". We hear the violin of Kagermann crying on the scrolling of sequences to the gleaming tones. The soft piano of Detlev Keller and the very Latin acoustic guitar of Ebert come to harmonize a soft harmonious duel which rests on a rhythm become more sustained by the chirpings of sequences and sober percussions. A stable but always ambient rhythm, where the airs of trumpets and the mosaics of synths' cumulus add a touch as much spectral than romantic into this very beautiful track which flows in our ears like a morphic sweetness. We have to wait until "Frozen Nights" to meet the first Teutonic rhythms of “Repelen - The Last Tango”. This rhythm, he is nervous and very typical of what we are used to hear from BKS! He jumps on bouncy sequences and tribal percussions whose meshing is covered by synths with waves which are just as shadier than the solos and the chthonian choruses can be discreet. These synths, as well as the violin, are decorating the introduction of "Lazy Afternoon" of tears and of rather lyrical lamentations. If this intro seems foggy, even a bit cosmic, the track eventually offers a soft supple rhythm with a suite of sequences which hatches a spherical approach strongly flavored by Berber tribal essences. "Clusterphonie" is the pearl of pearls of “Repelen - The Last Tango” and possibly of all the whole Repelen series. And yet, everything here is so simple with the notes of piano which sing in the shadows of other ones which skip of a minimalist pace in order to forge an innocent ritornello which swirls and swirls. The musical itch is created. The violin enters and crosshatches the melody of curt riffs. The percussions follow. They drum a rhythmic as innocent as lively, entailing in the furrow of its strikes a swarm of harmonies sculptured in seraphic voices and synths layers whose veils are painted of foggy silk. The rhythm becomes livelier and we never felt it coming this way. This is simply wonderful. Maybe the gentle and innocent earworm of the year. Anyway, I made that tune played so much that the snow banks around my condo have melted right away! "Latin Grooves" quite means! On a quite catchy rhythm where a line of bass draws the sketch of a very beautiful groove, the guitar and the violin are going for a good harmonic duel which erases the synths and their discreet filets of blue mist. Before ending with the very ambient and tearful "The Last Tango", "City Lights" offers the most Berliner approach of “Repelen - The Last Tango”. Its introduction is as much intriguing and dramatic as a good movie about war or spy story in the Middle East. But once this mood past, the rhythm livens up with nervous sequences which skip in other lines of sequences and their criss-crossed movements. The synths throw a veil of mysticism while the rhythm gets more nervous and more jumping, riding a minimalist rhythmic cavalcade which belongs to the signature of Broekhuis, Keller & Schönwälder whose synth fogs and solos, electronic percussions and sequences always end forging these invigorating charming Berliner minimalist structures.